For the most part, we expect fire trucks to be red. Sometimes they’re yellow. I bet you’ve never seen a purple one. Or have you? Turns out, some fire stations have rolled out a purple fire truck this October to raise awareness during domestic violence awareness month. If you’re married to a firefighter who grew up in a violent home or are a survivor of domestic violence yourself, you’ll love Kyle Design’s cute purple firefighter themed gifts. They are pictured in red, but all of Kyle’s gift items can be customized with any color – choose purple to spread awareness against domestic violence or even pink for breast cancer. Or, just add your husband or wife’s favorite color to create a truly unique birthday or anniversary gift for him or her. I haven’t seen one in person yet, but I hope my community rolls out a freshly painted pink or purple fire truck this month too! I binge-watch Damages on Netflix. I can’t help but wonder how accurately it portrays the life of an attorney. If it does a pretty good job, then I have to admit I’m a little glad I didn’t go into law. On the show, the characters eat, sleep and breathe their jobs. There is no time for a social life outside of lunching or grabbing late-night drinks with your colleagues. And do these people ever sleep? Basically, I have a major respect for anyone who decides to practice law. Which is why I love these unique gifts for attorneys that feature a decorative Law Scales of Justice design. If you’re looking for gift ideas for attorneys, I think you’ll love the selection at Kyle Design. There are attorney badge reels for court, professional card cases with engraved names, embellished stainless steel flasks, gavel Christmas ornaments and other gifts for an attorneys office they can use at their desk. Personalized attorney gifts are great for new attorneys, for your boss on his or her birthday, for your legal staff at Christmas, and for retiring attorneys at their retirement party. The other night my husband and I went out to dinner and on our way out the door I thought we were eating really late. But once I buckled up, a quick glance at the dashboard clock corrected me – it only felt late because it was already dark outside. And as I looked at the calendar on my phone, I realized it’s about to get darker a lot earlier because Daylight Savings ends this weekend on Sunday, November 2nd. I’ve already decorated my home for Fall (loving the scent of my pumpkin spice candles!) and it’s about time to start using my Fall night lights. I hate coming home to a dark house in the evenings so I always leave a night light on in my kitchen. Whether you’re looking to add some light to a dark bathroom, hallway or kitchen, you’ll love creating your own custom night light at Kyle Design. Kyle’s decorative night lights are handcrafted with her etched metal artwork and custom stained glass. Each elegant light is created just for you – choose the elegant amber glass to fit into any warm decor, or get red glass for your kitchen, blue glass for a bathroom or purple if that’s the color of the decor in your home. The metal etched designs of Fall leaves, trees, nature, hot beverages and more come in a variety of finishes including silver, brass and gold. Kyle’s polished and brushed silver night lights look excellent in trendy homes with gray walls. If you have warmer tones, you’ll enjoy the brushed brass or polished gold night lights. These Fall themed night lights make excellent gifts for Fall birthdays or as way to thank a host for having you over for a holiday dinner or Thanksgiving. They offer a beautiful way to decorate your home for Fall and are a great alternative to standard, tacky plastic nitelights. As we say goodbye to October and welcome November and December, let’s not let setting our clocks back result in stumbling around in the dark. Order a custom night light from Kyle Design. I’ve been hearing a lot of back to school excitement…from tired parents! You’ve got enough on your plate getting your little ones ready for the first day (new clothes! fresh haircuts! fancy backpacks! back to school supplies – does this list get longer every year?!) – let us create a unique teacher gift that your child’s new teacher will love and appreciate on the first day of school (his or her summer vacay just came to a screeching halt after all!). Has your son or daughter spent the summer reading? Reward them with cool summer reading bookmarks. They’ll love Kyle’s small metal bookmarks in fun colors personalized just for them. Add a cute animal, sport, letter or fun design and his or her favorite color. Get a hot pink crown bookmark for a young lady who loves to read or a blue rocket bookmark for a young man who loves space and science. Shop unique bookmarks to browse hundreds of unique designs on gold or silver metal bookmarks which can be engraved. You’ll find cool bookmarks for kids with designs of flowers, nature, sports, games, symbols, numbers, food & more. To custom create your own special bookmark, click Customize My Bookmark and select your favorite bookmarker style. Then, add any of Kyle’s designs to that bookmark using the Design Chooser. With nearly 30 cool aluminum and iridescent colors, you can create the perfect gift for any boy or girl who loves reading. Make it a keepsake by adding an engraved name to the back. Wedding Season is in full swing. With 3 of my girlfriends about to walk down the aisle, there’s a lot of exciting things going on this summer. One of my favorite pre-wedding activities is the Bridal Shower. I just love an afternoon full of women, showering the bride-to-be with gifts. One thing I always try to do is buy off the bride’s registry. While I know it’s fun to open something you requested, I think it’s even more fun to open a gift that you never saw coming, and that you just love. And who doesn’t love a gift that’s personalized? Give the bride a nice set of wine glasses and a unique bottle stopper. These wine bottle stoppers can be personalized with your choice of color and center design. Add her last initial, favorite pet or choose from hundreds of other designs. Help the Bride prepare for her Big Day with a Day Of Survival Kit. Personalize this adorable metal case with any 3 colors and then throw in bobby pins, a sewing needle and thread, safety pins, mints, super glue – anything that could be a life saver to the Bride on her special day. She’s about to hit up the best party of her life – her wedding day! Help her celebrate in style with a customized wedding flask engraved with her name and wedding date. Fill it up with her favorite alcohol to help her get through some of the stressful incidents she will inevitably encounter while planning. Add her monogram to this wooden wedding keepsake box where she can store a wedding invitation, her favorite reply cards, the card she gets from the groom and other treasures from her big day like a monogrammed napkin or matchbox. Personalize it with her wedding colors and have it engraved with her wedding date. For more great Bridal Shower and Wedding Day gift ideas, click Gifts for the Bride. All gifts are personalized just for you and even gifts with engraving your gift ship out in just 1 – 2 business days. If your birthday falls on or near a holiday, you know how difficult it can be to separate your birthday from the holiday, and how hard it is to get a group of people together to celebrate. One of the best holidays to have a birthday is 4th of July. Lots of people love to get together for great food, fun and fireworks. You can have so much fun with a patriotic party theme and the weather is guaranteed to be warm. Creating a personalized birthday banner is another fantastic way to make the birthday guy or gal feel special. Hobby Lobby and other craft stores sell blank burlap pennant banners which you can decorate any way you want. Use red and blue paint to write out their name or birthday message. You can also make a similar banner using scrapbook paper and twine or ribbon. Below is a “Happy Birthday” banner that can be purchased on Etsy. Next to that is a banner that says “Love” that I’ve included since it has a great tutorial on painting your own custom burlap sign. This is where you want to keep the cake birthday themed. Don’t do a flag design with a fruit topping or frosting – if you do, it won’t really feel like a birthday cake. Whether you plan to bake a home made cake or order one from a bakery, keep the red, white and blue color scheme with some stars or fireworks, but stay away from flags and keep it birthday oriented with a “Happy Birthday” message. Patriotic Birthday Cake from Tita’s Cakes & Creations in San Antonio, TX. Top the cake with sparkler candles from your local party store, or buy some online. We found the ones below at Shindigz.com. 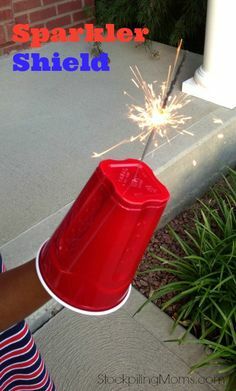 Hostess with the Mostess blog has excellent party games with a county fair theme which are perfect for any 4th of July party. Click the image below for instructions on DIY ring toss, balloon darts and more. Send party guests home with these memorable American Flag party favor bookmarks from Kyle Design. Choose from 30 colors to personalize for each guest. You can also engrave the back with their name and the date. Follow our 4th of July Celebration board on Pinterest for other great Independence Day Party ideas. Father’s Day is Sunday, June 15, 2014. If your dad is like mine, he can be a little (scratch that – a lot) hard to shop for. I know he loves when I get him something personalized, but several engraved keychains and picture frames later, I had run out of ideas (and I think he’d run out of desk space). Then I realized something. My dad is extra special. Why should I get him something “typical” for Father’s Day (#1 dad mug? new tie?) when I can give him something that shows him the many ways in which he’s special to me. What did your dad teach you? Celebrate the lessons he taught you with a meaningful Father’s Day gift from Kyle Design. Pick from 100s of unique designs on cool gifts for dad like flasks, business card cases, tape measures, money clips (and more!) and customize it with his favorite color and an engraved message about an important thing he taught you. It will be the best gift he’s ever gotten. In the U.S. the #1 health problem isn’t cancer, heart disease or even obesity. It’s addiction. One in 12 adults have an alcohol problem and the numbers are higher for illegal drug use and prescription pill abuse. Chances are you or someone you know struggles with an addiction of some kind. Thanks to AA and other substance abuse recovery programs, more Americans are getting sober every day. For someone who has beat an addiction, every day of sobriety is something to celebrate. Reaching sobriety milestones – 30 days sober, 6 months, 1 year and beyond are major accomplishments for recovering alcoholics or drug addicts. Programs refer to these milestones as anniversaries or birthdays. Is your sister celebrating her 1-year sober birthday? Maybe your husband has been clean for 10 years. Your son might have come out of rehab a new man who you’re so proud of him for making the commitment to clean and sober living. Recovery gifts are a wonderful way to show your support for your friends and family members who struggle with addiction. ♦ Engrave a family bookmark to thank your husband or wife for choosing family over addiction. ♦ Personalize a Big Book wooden memory box and fill it with notes of all the good times you’ve enjoyed together since your mom or dad has gotten clean. ♦ Customize a new beginning money clip with an engraved congratulatory message for your son or brother. ♦ If you’re a sponsor, engrave your phone number on an I’m A Phone Call Away gift to remind him or her that you’re always there for them. ♦ Or, if you’d like to thank a sponsor for getting you to your sobriety birthday or anniversary, add a thank-you note to a coffee clip magnet or other unique recovery gift. At Kyle Design, you can shop unique gifts for sobriety milestones. Gifts include Kyle’s exclusive etched metal designs that are symbolic of new beginnings and recovered families, such as the sunset, tree of life, cross, Big Book and more. Every item is handcrafted and customized with your color choices and many gifts can also be engraved. Personalize a sobriety night light, keychain, locket, pill box, ornament, jewelry box or other meaning gift for someone you love. Click Shop Recovery Gifts for Kyle’s exclusive selection of sobriety themed products. “My sobriety depends on who God is, not who I am.” -Duane M.
Voluntary water usage cut-backs have become mandatory here in the Bay Area. We’ve been told to collect the shower water that spills out as we wait for it to get hot in the morning and find a use for it such as watering our plants. We’re supposed to turn off the water while we brush our teeth and scrape our dinner plate scrappings into the trash instead of rinsing them down the sink. Showering used to be a nice way to relax underneath the flow of the hot water but is now a game of “How Fast Can I Get This Done?” and building guilt over how much water is spilling down the drain. I can’t even think about stepping onto my driveway with soap, hose and car wash bucket. What better way to keep water conservation at the front of your mind than with a little reminder? Buy a water drop bookmark, badge reel or money clip to help you and those around you stay focused on doing our parts to get us through this drought. Kyle has several gifts featuring her water droplet design – shop water conservation gifts to customize yours.